Starting the School Year With a BANG! 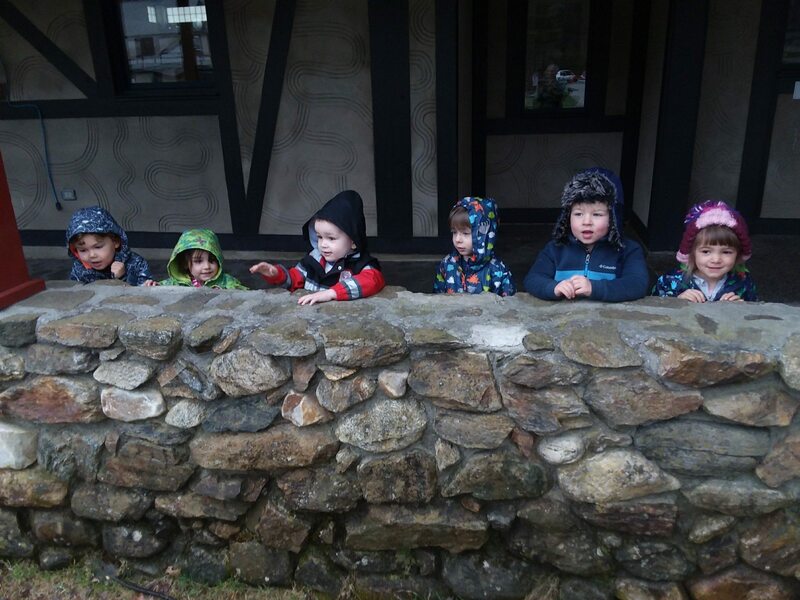 On just the third day of school, nature provided the Preschool class with such an exciting and memorable event. While the children were in their very first gym class, a powerful thunderstorm rolled in. We had wind. We had very bright lightning and very loud thunder. We had torrential rain. We had a shared experience. The thunderstorm hung around for a while, so the children were “stuck” in the gym – a pretty good place to be stuck, with Mr. Storti, and Kristina, and plenty of balls and hoops to play with. When Dr. Segar made the rounds around campus to check on everybody, he stopped in to see them. He comforted a frightened child and listened to another who had a lot to report. Meanwhile, I was “stuck” back in the classroom. When the wind came up, I frantically ran around closing windows, which had been wide open against the stifling heat. Eventually, after the lightning and rain subsided, I walked over to the gym to join the children. In the end, even the families got to share in this unusual event. At pickup time, the lightning was gone, but it was still raining. So parents or grandparents had to find us at the gym to take us away under the cover of umbrellas. 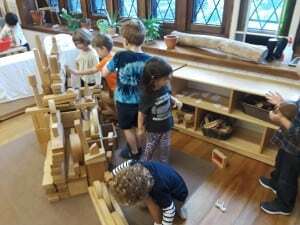 A group builds a “fire boat” together. The next day, what did we talk about at Morning Meeting? The rainstorm! What IS rain? Why does it rain? What do we find on the ground in the rain? What do we like to do in the rain? The children had a lot to say. We read books: Rain Drop SPLASH by Alvin Tresselt, wherein rain grows into a stream, which grows into a river and into the sea. This led to a discussion of boats. In one of our discussions, somebody shared their knowledge that sun and rain together make a rainbow. Oh gee, we HAD to read Sky Fire by Frank Asch. Somebody asked the big question: Why does a rainbow disappear? At nap time, the children notice the rainbows on the floor, made by the prisms hanging in our windows. What makes that rainbow? Hmmm…. Just like that, in the blink of a thunderstorm, a project was born. Our class will continue to explore water and things related to water. 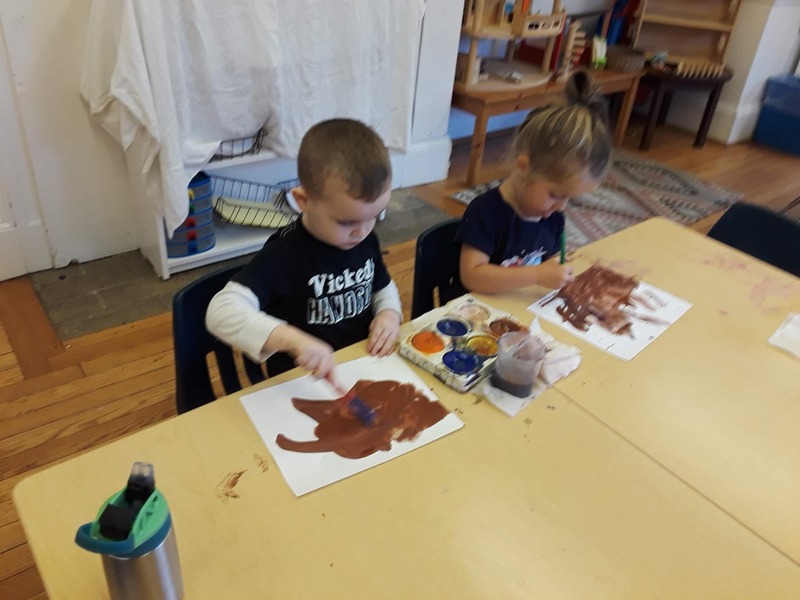 Already they are expressing their knowledge of water and storms through language – “sprinkle,” “pour,” “wet,” “soaked,” “gushy;” through art – one child dots paint on paper to make rain, another swirls paint with a brush to make wind; through building – every day a new kind of boat. 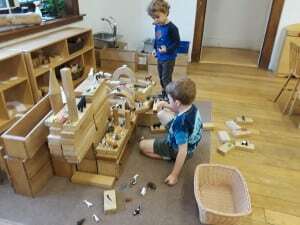 Two children work on a “zoo boat.” After classifying the animals, they assign them different living spaces. Now, instead of frantically closing windows, I am frantically trying to record their words on paper; save their artwork; and capture their constructions with a camera. I struggle to keep up with their free and agile activity. My teacher-brain struggles to keep up with so many ideas of ways to provoke their curiosity and imagination. We have a stream and a pond to visit, mud to find, water droppers to play with, paint to blow, a rainbow to construct, more boats to make. 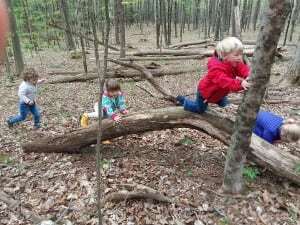 This is Reggio-Emilia: Environment is the third teacher. Teacher and students explore and learn together. 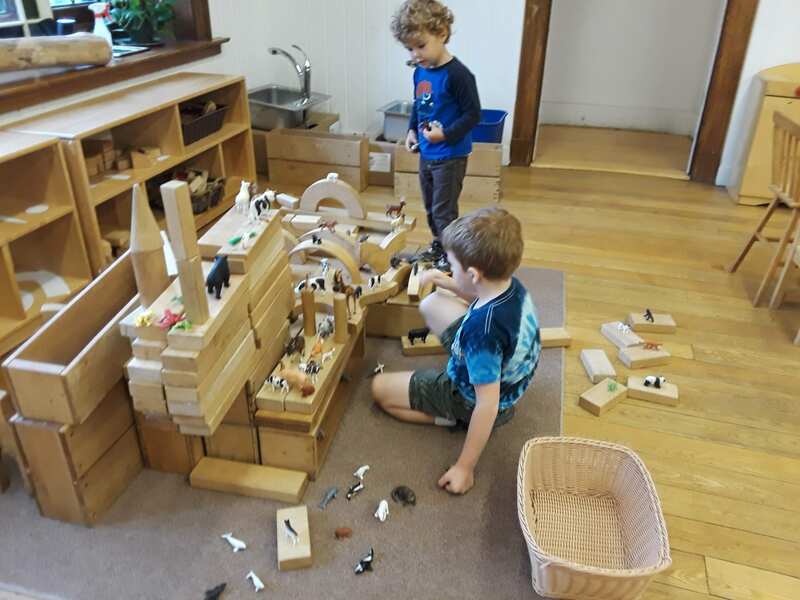 By Julia Kreilkamp|2018-09-18T08:44:03-04:00September 17th, 2018|Categories: Preschool|Tags: early childhood learning, project learning, purposeful play, Reggio Emilia|Comments Off on Starting the School Year With a BANG! 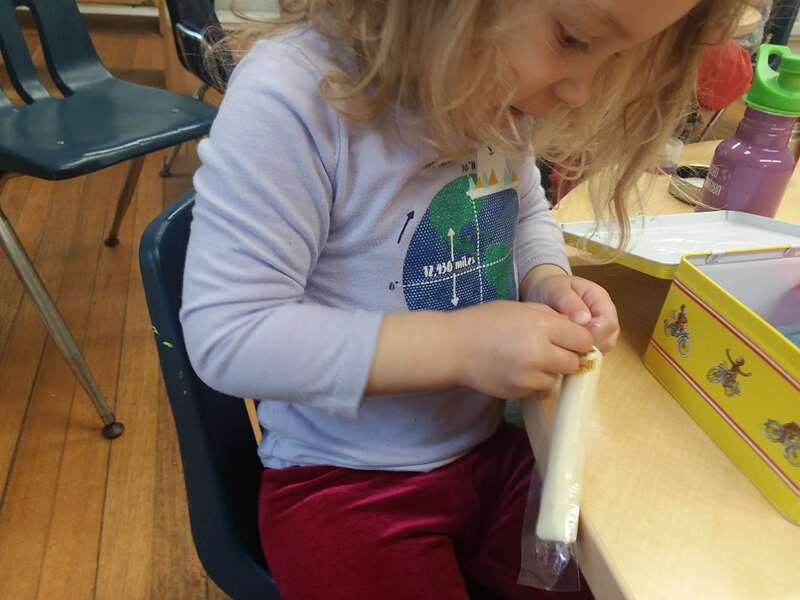 On a recent winter day, the B2’s assistant teacher, Carli, was unexpectedly sick. What to do? Our Associate Head of School, Leigh Doherty, filled in, and spent most of the day with me and the B2’s. Even on normal days, Leigh is a regular visitor to our classroom. The children always love to see her, she knows them well, they know her, and she loves to be silly with them and pay us a visit to get a dose of cuteness. I was so happy to hear Leigh’s comment. 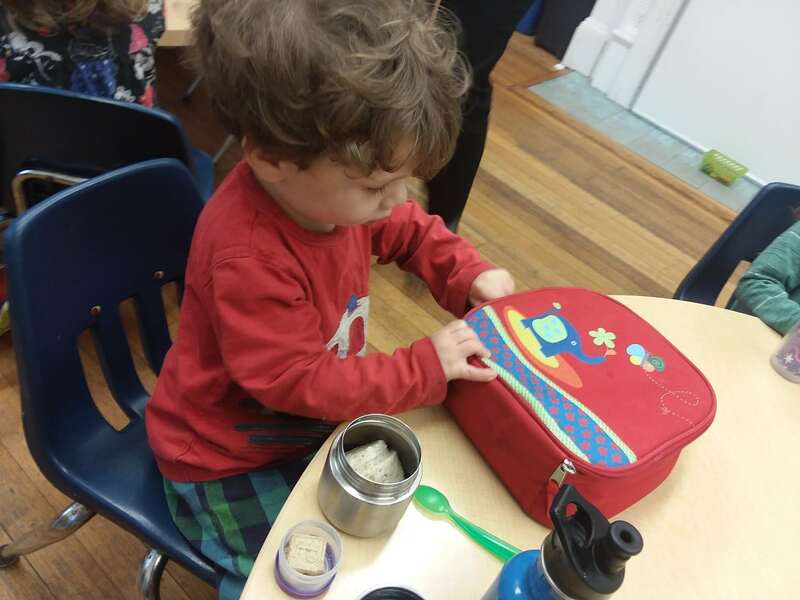 It’s easy to appreciate two and three year old cuteness, but for the finale to this school year’s blog posts, I thought I’d shine a light on the hard work these young children engage in each day. So here is my course description! This course reflects BCD’s core values of community and respect. In this class, we will explore the many facets of becoming a member of a community, and engage in intensive practice with life skills. 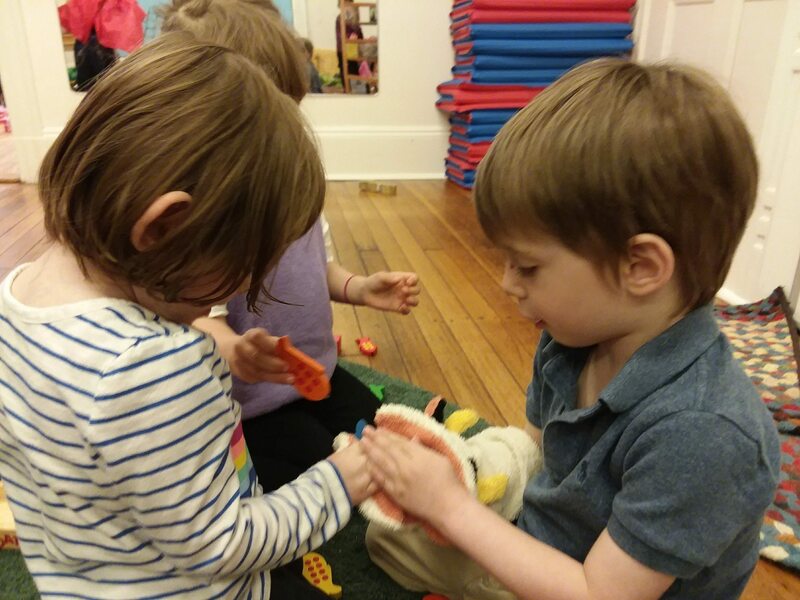 Through attentive guidance and consistent routines, the children will be introduced to ways to navigate life’s common but challenging social skills — sharing, taking turns, recognizing another’s pain, meal time etiquette, and teamwork. They will also be encouraged and expected to persist towards mastering essential practical life skills such as eating with a utensil, washing hands, putting on and taking off jackets and other clothing, and removing and putting on socks, shoes, and boots. Toileting practice is also encouraged and supported. 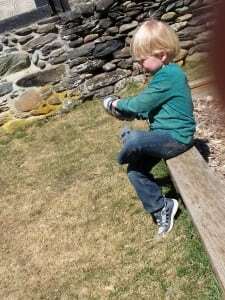 The children will face a range of other physical challenges, including managing lunch boxes, food containers, and ziploc baggies ; drawing and painting with various tools; stacking blocks and digging with a shovel; removing sand from inside shoes; climbing ladders and walls; throwing and rolling balls; jumping with two feet; pedaling bikes and navigating with scooters. The curriculum also includes safe stick play, story time etiquette, and what to do when encountering insects, chipmunks, and dead birds. As if this wasn’t enough, the B2 children will also learn a great deal of expressive language during their school year. Some will move from single words to speaking in sentences, and learn to articulate multiple sounds and blends. Each child’s vocabulary will grow enormously, and most will learn to answer questions, and engage in conversation of a few exchanges. Their language develops through intense social interaction; through reading books and singing songs; and through rich experiences with new materials and exploration around our amazing campus. They do all of this while beginning to face the daunting challenge of learning appropriate and effective ways to manage their most basic emotions of sadness, joy, and anger. 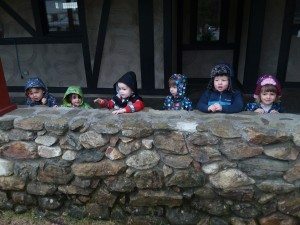 After completing this course, the children will have mastered many life skills, and be very familiar with the benefits of persistence, perseverance, and kindness when solving many of life’s daily problems. 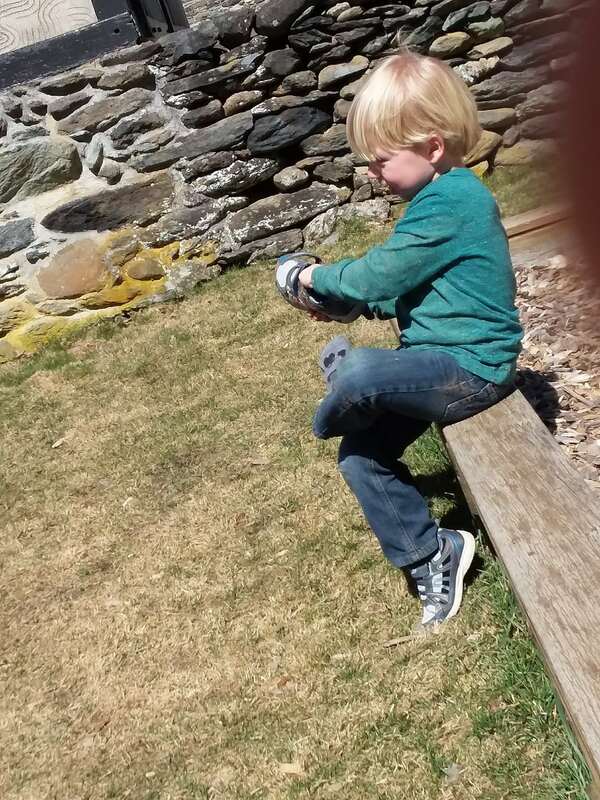 Yes, small children are cute. But here at BCD, our focus is on respecting the hard work they engage in each day.